Twice in the last week, when I manually downloaded the daily MSE defs, I get a popup that says "You must close Firefox". This surprised me since I close the browser before downloading the defs. What could be happening? Firefox is still running in the background. I check Task Manager and it doesn't show any Firefox processes running. 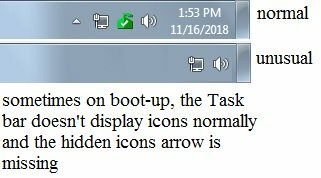 Another thing is that the days this happens, the Taskbar icons do not look normal (see attached screenshots). If that didn't work, I'd try restoring my latest backup. (I use Macrium Reflect Free to do a full backup weekly, Even if I'm using the computer. Doesn't matter). If still no luck, it may be type of Malware infection. Recommend reading these instructions first: Malware and Spyware Cleaning Guide. Then click here to start a new topic the Virus Spyware, and Malware removal forum. After you've been given a clean bill of health from one of our Malware experts, and if you're still having the same problem, return to this thread se we can pursue some other options. It looks like a virus. There are many of them now that look like pop-up windows. Moreover according to your screenshot it seems like antivirus is turned off. Scan your computer and check all the soft for updates. It's very easy to catch a warm now.